I must have some kind of addictive condition - I can't stop making these folders. Look closely at my amazing good luck in that the foldover part actually meets the pattern it folds to. What are the chances of that? Sometimes, good luck happens! Do you see the decorative button? DH didn't understand the concept of cutting that spool lengthwise - somehow when I said "button" he insisted is HAD to be cut across the spool! It just goes to show how we all think differently. I finally DREW it and he kindly offered to cut, sand, drilling holes. It's perfect -- flat on the back! And I have another one just like it for the next project. I love this! Oh my but you were lucky how the fabric pattern lined up -- good fortune is smiling on you! BTW, you mention you live in the NB panhandle... is Chadron anywhere close by to you? My two great-aunts lived there. A very pretty little town. I wish I could beam on over and be inspired by your doing-ness. I've been wanting to make a few of these for awhile. Thanks for sharing. Just tell us you worked really hard to make the fabric match up and we will all be amazed at you cleverness. But the spool button is cleverness!! Very cute idea! That is adorable! Amazing that the fabric lined up! Oh, I love your spool button. Now I regret tossing some, even thinking "these must be good for something" and still not keeping them. Very nice! Some addictions are good! That matching fabric's not luck, that's skill, honey (and if anyone asks that's my story and I'm sticking you with it)! I love the spool button idea--genius! See skill just like I said (and having a handy hubby doesn't hurt either)! Die Kätzchen sind ja süß und machen sich sehr gut auf der Tasche. Ich wünsche Dir eine Schöne Advent und Weihnachtszeit. Wow! Perhaps a little genius resides in you. Or, quick, figure out the repeat on that fabric and then find all the fabric you have with the same repeat! It looks great! And the major cleverness award goes to Elaine this week! Yeah... love the button. Hum, do I have any wooden spools left? Or did you buy them some time. 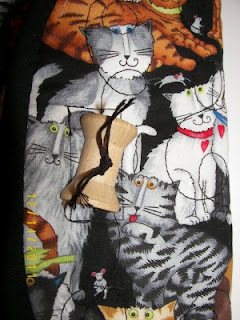 Love the black, white and red fabric in the last post.... You are just churning out these cute covers. Thanks for sharing them with us... and this is number ???? So clever - a one, oops 2 of a kind button! That is so neat! And the spool just makes it that much better. I agree--it was SKILL that lined those kitties up. Hey--you know cats NEVER do what you want them to! I think you should have a new title "Elaine--Master Cat Wrangler"!! you have been so busy lately! Looks like you planned the match! Great job! I love your folders! And kitties aren't know for being so cooperative to line up like that! WOW! It looks as if it would fit my Kindle Touch 3G! You must live life right. I feel that way when patterns line up without trying or things work out evenly when you are not sure you have cut enough! Orca Bay, Step 6, in Process - CUTE!